We passed through handily-marked gates (at both ends of the street), which in most American cities would indicate where a Chinatown starts. In Taiwan, it's to show you where the night market starts. Right away Justin pointed out a really popular vendor selling hujiao bing (marinated pork in a flaky crust). I've waited in enough lines in San Francisco, so we passed by the 10-15 people queueing there and made our way down the street, when I couldn't stand passing by so much amazing food -- the smells were making my stomach growl! 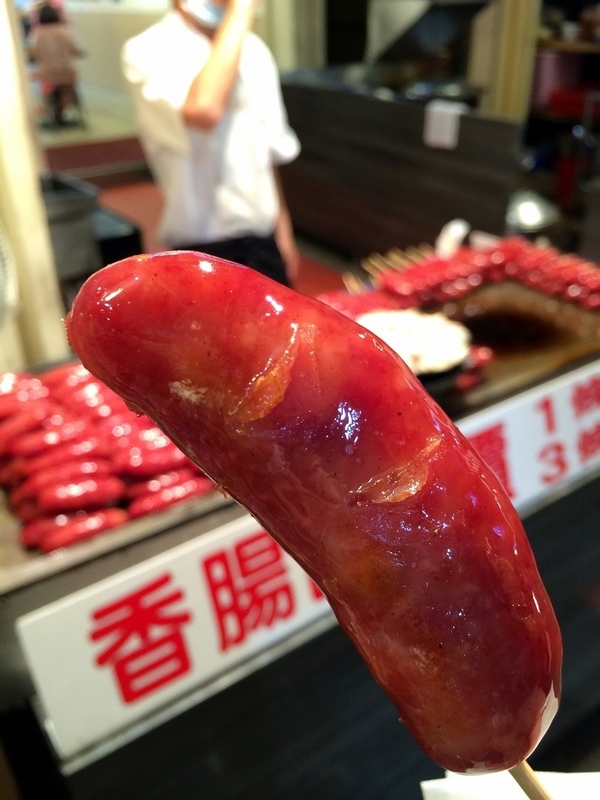 I'm not sure anymore what exactly we were looking for, but I got a pork sausage to take the edge off my hunger. We passed by a few stinky tofu stands, but they either didn't smell stinky enough (a very important measure of how good it's going to be) or they were completely mobbed by other people. 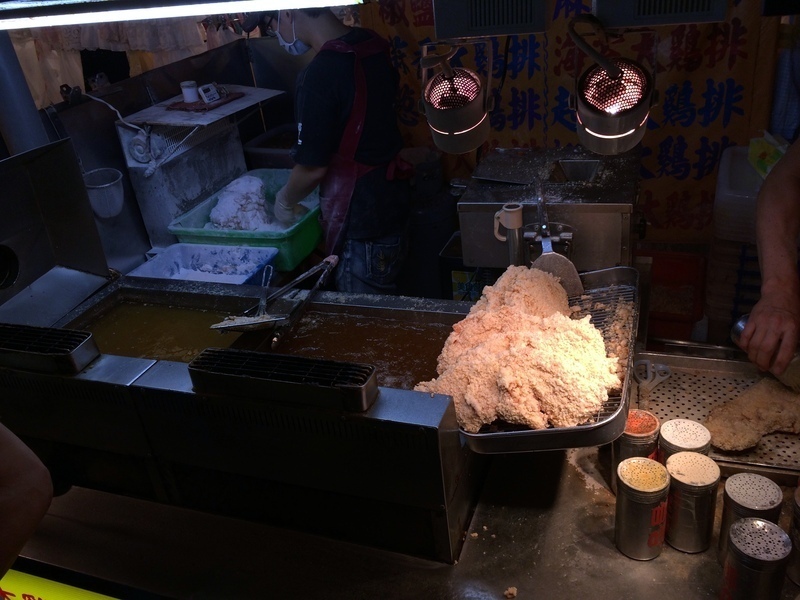 Eventually we found a stall that had a bunch of extra seating inside of the old Songshan market, and we settled in on our rickety stools for some really Taiwanese delicacies. I have to admit, I'm not really a fan of this Taiwanese dish. 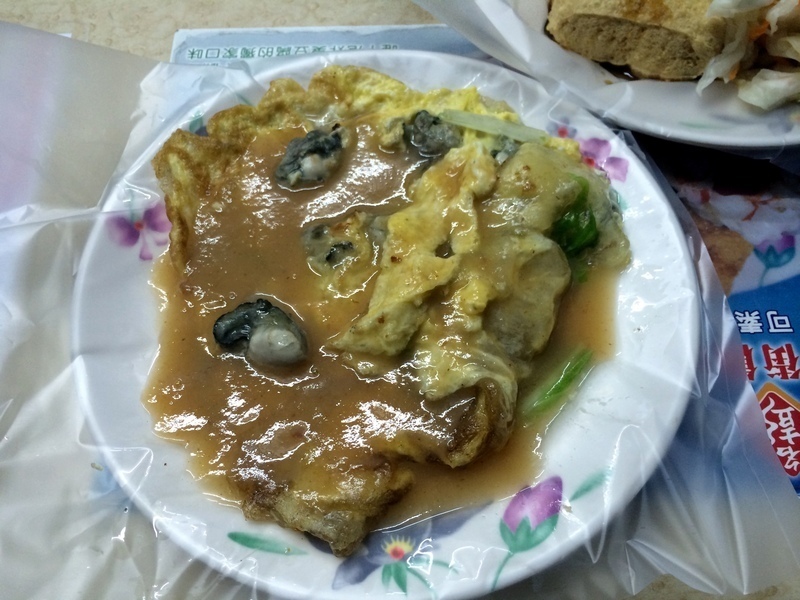 I don't think my parents particularly like it either, so I also wasn't introduced to oyster omelettes as a kid. There's a little too much gooey starch mixed in with a gooey egg and some gooey oysters. I'm not squeamish about the texture, but combined with the sweet sauce, it's not particularly appetizing. On the other hand, I've been eating stinky tofu forever. 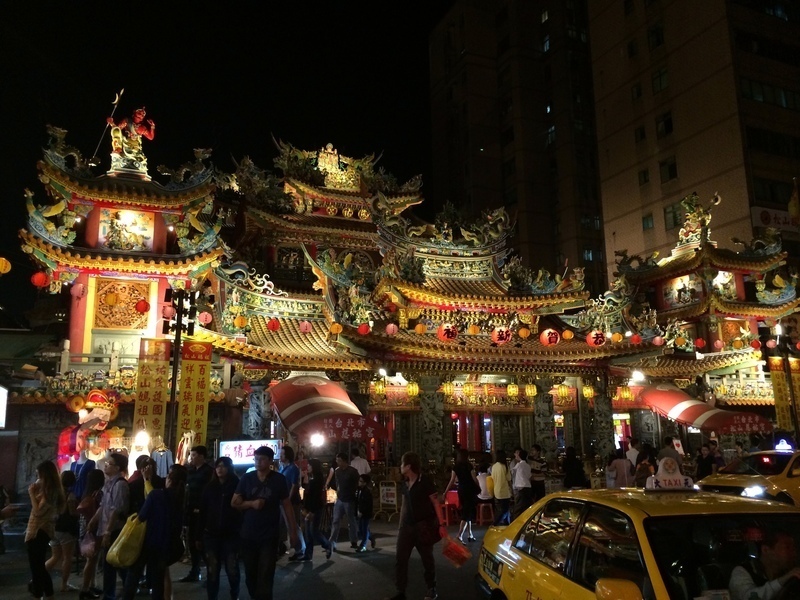 I remember as a little kid visiting my grandparents in Taipei, my parents put me in some sort of kindergarden/daycare for a few days, and when the stinky tofu man would come by in his cart, the teacher would order some and share it with all of kids. Up until this point, I've always eaten stinky tofu fried with kim chi and other pickled vegetables. It's hot and crunchy and spicy. 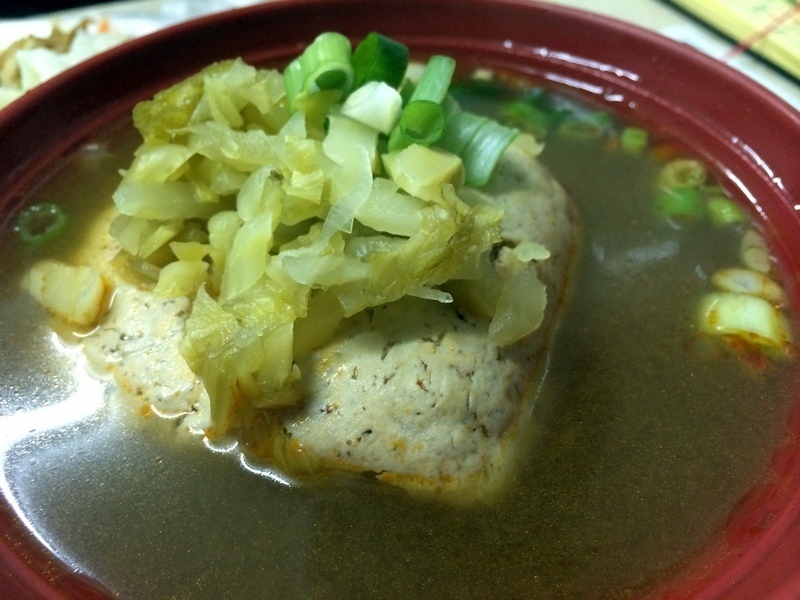 This time though, I was introduced to stinky tofu in soup. Obviously, that's not a picture of pig's blood cake. 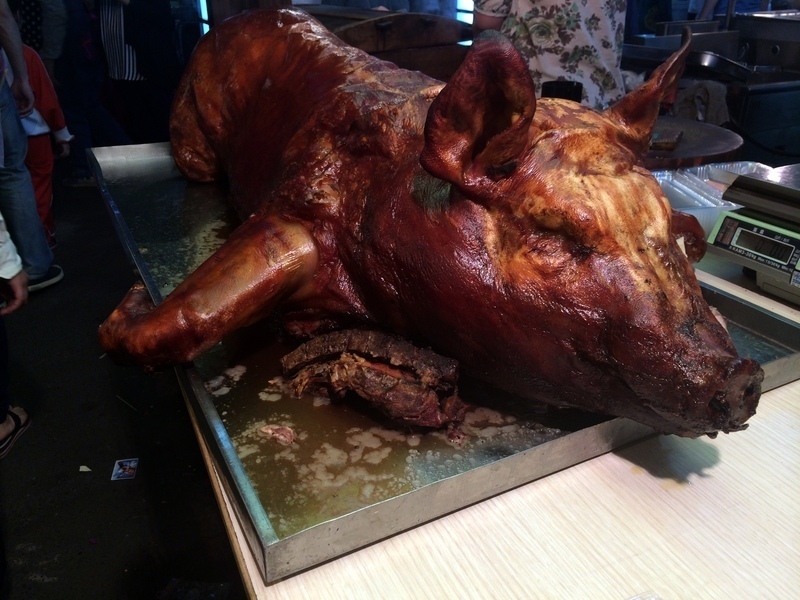 But that giant roasted pig was at the same stand that was selling blood cake, so I thought it'd be a slightly more exciting picture than some reddish-brown squares on sticks. I didn't have any, but I have had it in the past on sticks and in soups, and I don't really remember it being that different in texture from tofu. Definitely better than the German blood sausage I've had. Justin had a hankering for fried chicken, so we walked through the market with our eyes peeled for two ladies selling giant fried chicken. We eventually found a stand, but the two old ladies were nowhere to be seen. The chicken pieces really are gigantic (check out the photo above where Justin is holding his for comparison), bigger than any schnitzel I've ever seen. They put it through the fryer for you, and then you can choose what kind of powder to put on it. There are a couple savory options, but Justin opted for the sweet coconut flavor. You can have them cut it up for you. I think, though, that it's way more satisfying to take big, crunchy bites of a piece of chicken bigger than your head. 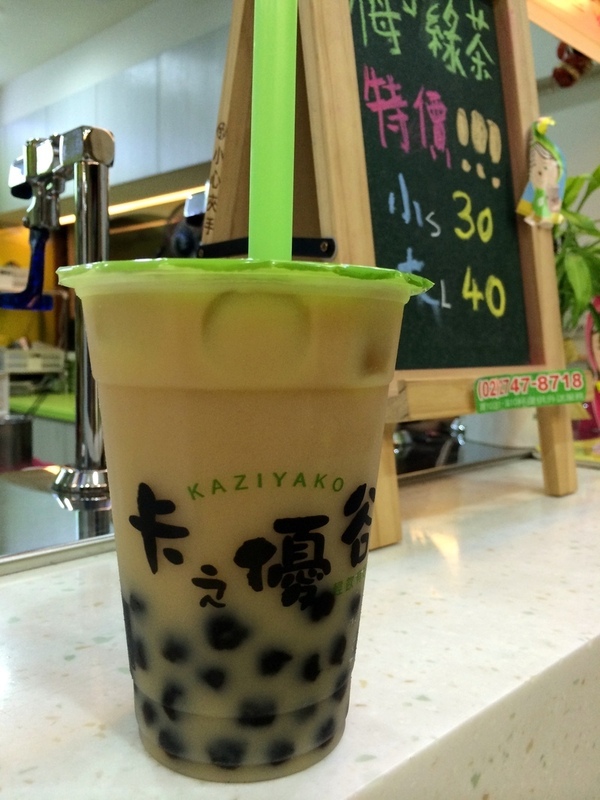 You've heard of bubble tea, and maybe you've heard of Yakult (养乐多 yang-le-duo in Chinese), but did you know you can mix some lemon juice in and make a refreshing new drink? Yakult on its own would be a little too sweet to drink that much of, but adding some citrus makes it just the right amount of tart. After criss-crossing the market a few times, I'd definitely eaten enough and seen everything. That's what I liked about Raohe over the Shilin market. Shilin is a maze of multiple streets and buildings, I always feel like I've missed something really cool. Raohe is basically just one street, and you can walk up one side of it and down the other, and you'll have seen, smelled, and tasted everything.